Efficient and easy to use, the Jonsered GTS 2228 string trimmer with straight shaft is powered by a 28cc 2-cycle gas engine, and provides a 17-inch cutting swath. The GTS 2228 features Spin Start, making it extra easy to pull the starter cord and get going, while the auto return stop switch puts the machine back to the start position for trouble-free starting. The intuitive controls provide easy access to the choke and purge for smooth operation. It also features a twin line cutting system with Tap 'n Go for quick line feed. Get a great value with this Homelite trimmer. 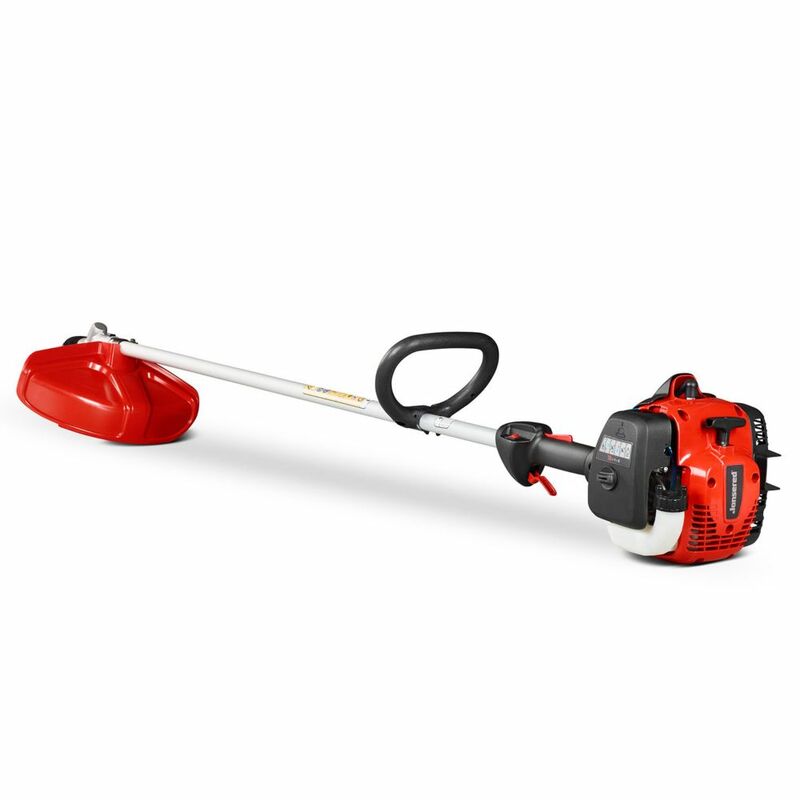 Its sizable 13-inch cutting width and its ability to shift easily to edger mode make your yard duties much easier. Adjust the shaft length to fit your needs. The reliable 4 Amp electric motor starts instantly; no messy gas or oils to mess with. All backed by a two-year warranty, this no-frills Homelite electric string trimmer is all about performance at a great value. Introducing the RYOBI 2 Cycle Gas Curved Shaft String Trimmer with a full crank engine for 2X longer life. This string trimmer accepts RYOBI Expand-It Universal Brand Fit attachments adding versatility to your trimmer. Simply attach a cultivator, blower, or even a hedge trimmer to the power head and quickly move from project to project. Save time, save space and save money with the RYOBI Expand-It System. RYOBI makes string head reloads easier with the REEL-Easy String Head; thread your string, twist the head, and resume trimming. Backed by a 3 year warranty, trust the RYOBI 2 Cycle Gas Curved Shaft String Trimmer for your outdoor trimming needs. 28cc Straight Shaft 2 Cycle Gas String Trimmer, GTS 2228 Efficient and easy to use, the Jonsered GTS 2228 string trimmer with straight shaft is powered by a 28cc 2-cycle gas engine, and provides a 17-inch cutting swath. The GTS 2228 features Spin Start, making it extra easy to pull the starter cord and get going, while the auto return stop switch puts the machine back to the start position for trouble-free starting. The intuitive controls provide easy access to the choke and purge for smooth operation. It also features a twin line cutting system with Tap 'n Go for quick line feed. 28cc Straight Shaft 2 Cycle Gas String Trimmer, GTS 2228 is rated 2.3 out of 5 by 3. Rated 5 out of 5 by David from Easy to start and lot of torque! This is a rebranded Husqvarna 129L, everything is the same other than the color of the plastic. I bought this trimmer summer 2018. It is powerful, easy to start and a lot of torque. Rated 1 out of 5 by Lawn trimmer from I wish I'd never bought it As the previous reviewer said, GOOD LUCK in trying to intuitively figure out how to re-string this trimmer. Also, it has a really small gas tank so, for big jobs, expect to stop and refuel a couple of times. If you want the advice of someone who owns it...look elsewhere. Rated 1 out of 5 by Billb from Terrible - impossible to reload new line This Weedwhacker is virtually impossible to read load line with. It has separate line running in and out and no instructions in the manual and completely mysterious markings on the head itself.